Lipstick that looks great on everyone, has bold vibrant color AND won't rub off on your gorgeous cosplay!! Welcome to CHU! by Kayla. Get ready to have your life changed forever. Propmaster Josh and The Corps Dance Crew have teamed up to bring you a prop rental service for your cosplay adventures. Click here to browse the prop store. 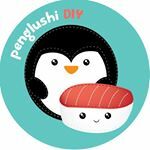 Brought to you by NJ and Ryo of The Corps, Penglushi is your go to for cute charms, decor, and plushes. Creating works of art and custom commission pieces, these ladies are ready to take your order. click here to browse the penglushi diy store. In partnership with Poppy Apparel we're giving you a discount for some super fun and fashionable gear! Use code "SOURUMEITO" for 10% off your purchase! Click here to visit Poppy Apparel. Interested in having SoCal's premiere cosplay dance crew rock your products and joining our listed affiliates? We're always looking for sponsors and affiliates. Email us today at thecorpsdancecrew@gmail.com.